Image caption A Jewish community centre was one of several key targets in the Casablanca bombings. German police have arrested a man in connection with a deadly suicide bombing in Casablanca in 2003. 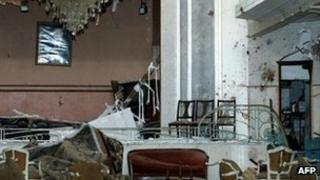 The attack on the Moroccan city left 45 people dead, including the 12 bombers, and many injured. The suspect, reported to be a 37-year-old French national of Moroccan origin, was detained at Munich airport after Rabat issued an international arrest warrant. A statement from German police said extradition proceedings had begun. The man was detained as he arrived at the airport with his family from Paris, German media reported. He was said to be travelling to Dubai. Suicide bombers set off at least five explosions in Casablanca in March 2003, targeting a Jewish community centre, a busy Spanish restaurant, the Belgian consulate and a luxury hotel all within five minutes of each other. The attacks, the deadliest in Morocco's history, killed 45 people and wounded more than 100 others. In 2009, Islamist militant Saad Housseini was sentenced in Morocco to 15 years in jail for the bombing, while co-conspirators were given shorter jail terms. He was also accused of making the bombs that killed 191 people on commuter trains in Madrid in 2004, after training in Afghanistan. Last year, a bomb attack in the main square in Marrakesh claimed the lives of 17 people, many of them foreigners.